Although today the Poodle is kept almost exclusively as a companion and show dog it is actually a water-retrieving gundog. The fancy show clips originally had a purpose to their design, certain areas were shaved to lessen the chance of snagging in the water, while others were kept long for warmth and to protect the vital organs. The ribbon in the topknot likely helped to find and identify the dog while it was working in the water. It is believed their name may be derived from the German word pudel, meaning 'to splash in the water'. In France they are called Caniche, which comes from chien canard or 'duck dog'. 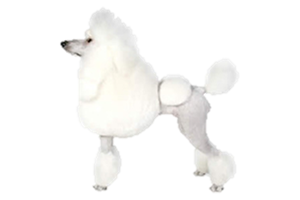 Known as the French Poodle, and also recognized as the national dog of France, many do not know that it is far more likely that the Poodle originated in Germany. While their ancestry remains largely unknown it is generally accepted that the Standard existed first, descended mainly from the Barbet. It is believed that the French later led the development of the smaller varieties. Is the Poodle Right for You?